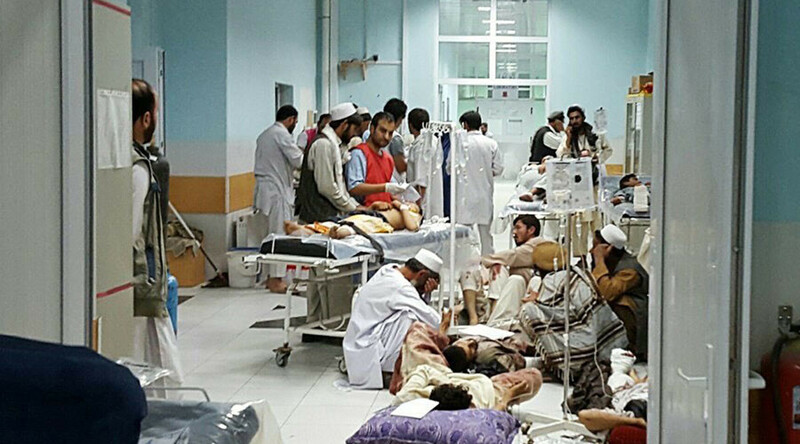 Pentagon has admitted its airstrike erroneously hit a hospital in Afghanistan that killed 22 people, adding that the Afghan military had requested the use air power. The top commander of US and coalition forces in Afghanistan, General John F. Campbell, said that Afghan forces told US forces on the ground that they needed air support. So US forces proceeded with the strike, which led to several civilians being “accidentally struck,” he said. Campbell said he was correcting an initial US statement that said the airstrike was called to defend US forces under fire. He declined to provide more details, saying a military investigation is ongoing. "We have now learned that on Oct. 3, Afghan forces advised that they were taking fire from enemy positions and asked for air support from U.S. forces," Campbell said. "An airstrike was then called to eliminate the Taliban threat and several civilians were accidentally struck. This is different from the initial reports which indicated that U.S. forces were threatened and that the airstrike was called on their behalf." Campbell said US forces’ errors would be “acknowledged,” but it was not as yet clear whether the strike on the hospital was the only mistake. He gave no more details, according to AP, referring to the ongoing military investigation. "As you know the United States military takes extraordinary steps to avoid harm to civilians. However, the Taliban have chosen to fight from within a heavily urbanized area, purposely placing civilians in harm’s way. We will continue to take all necessary steps to avoid future civilian casualties," Campbell said. The airstrike was requested by the Afghans, not the Americans, an investigator told Campbell. The general is currently based in Kabul, but was in Washington on Monday to testify before two congressional committees this week. Moscow has strongly condemned the US airstrike in Kunduz, stressing that it was inflicted despite the coalition forces being notified of the facility’s exact location. “We find it puzzling that the airstrike took place despite the international coalition being notified of the exact coordinates of the hospital to prevent possible attacks,” Maria Zakharova, spokesperson for the Russian Foreign Ministry, said on Monday. Campbell stated that the rules of engagement won’t be changed and haven’t been suspended due to one case. "Where they [the Afghan security forces] were three years ago and where they are today is pretty astounding. And I think they continue to be very, very resilient, and continue to need our support in any areas that we’ve identified a year ago that would be very tough for any army. Intelligence, logistics and fire support. So we’ll continue to work with our Afghan partners, continue Train, Advise and Assist," he said. Campbell “absolutely” rejected striking “those kinds of targets” - hospitals, mosques and schools, - explaining that the reason behind the attack was the plea for fire support of the Afghan forces when they “were under fire”.